Those of you not indiginous to these English shores may well have no idea where Ventnor, or for that matter, the Isle of Wight itself happens to be situated. If you are English and do not know either, then shame upon you! However this page is expressly provided to rectify any such sad and serious gap in the site visitor's geographical education. Our little gem, or more correctly, diamond of an island, half of which is an Outstanding Area of Natural Beauty and a mere 25 miles across by 13 deep, is understandably hardly likely to be regarded by you as exactly at the centre of The Universe, but it is to the 140,500 or so, incredibly lucky enough to find themselves living here. A particular joy for us is to be able to exist in the wonderful air quality which well over a hundred years ago a well known resident, the poet Tennyson, agreed with John Keats' description as 'worth sixpence a pint'. In present day less poetical terms that might be something like £15.31 per litre, but it continues to be worth every penny! For us, as we fill our lungs and chew on our straws, the rest of the world with its attendant tribulations ceases to exist. These maps may prove helpful in finding us. Our island is well worth visiting at least once, especially if you enjoy country walking as we are criss-crossed by an extensive system of well-signed footpaths. However those motorists for whom driving at motorway speeds is the norm should understand as they descend the ramp from the ferry that a somewhat more restrained technique is called for here. The map shows the several ways of reaching us, but note that the'Airports' are for light aircraft only. There are presently no air services : a service between London City airport and Sandown costing in the order of £100 one way was planned, but it proved to be pie in the sky. Strangely we have no helicopter service. Talk of bridges and tunnels arises from time to time, but nothing ever happens thank goodness. Either would be from nowhere to nowhere, so what's the point, and from where would the ten (or twenty?) billion pounds or so come from? Very helpful note : Have smelling salts handy when attempting to book a passage on any car ferry. Then after recovering from the initial shock, enquire about cut price offers, the staff may not reveal them initially or indeed, willingly, but they often exist. In addition I believe that Tesco vouchers may be currently accepted by Wightlink. You may find that Red Funnel prices are a little cheaper than Wightlink's. In general try booking at least three weeks in advance and booking 'on-line' may save £5. Also the outrageously high fare may be reduced by travelling incredibly late or incredibly early. The fares are arranged to be highest for Cowes Week, i.e. the first week in August, for all Bank holidays and during all school holidays. If you don't like crowded conditions, it might be a good idea to avoid travelling at the time of the Pop Festival too. With the aid of a petition our Island MP has successfully requested the Office of Fair Trading to investigate the the methods of the ferry operators : they did and decided that the astronomical fares are quite fair really! With Wightlink book on-line and hit the 'Special Offers' tab. To give you some idea a mid-weekday return for a car & driver+ up to three passengers is likely to be in the region of £70. I say 'likely' because their website is a bit cagy about quoting prices up front. But you'd better use the links in case I've been too lazy to update these prices recently. Pedestrians may travel on the car ferries of course but faster methods are also provided for them. Red Funnel has high speed catamarran things which they call Red Jets, and Wight link have something similar called Fast Cats. The slightly more adventurous should choose to use the novel, and brief experience of 'flying' across from Southsea to Ryde in about ten minutes by booking with Hovertravel who are the most experienced operators in the whole world of these unusual machines. If you haven't yet tried it then you really ought to. The transition from land to water is always a fascination as is the speed of travel. A day return ticket will cost you £17.50. When I travelled many years ago I thought it rather noisy but I understand that it may be quieter these days. If it is a rough day don't be alarmed when the craft is at the bottom of a trough in the swell and all you can see is an all encircling wall of water, as that is what people in all small boats experience. 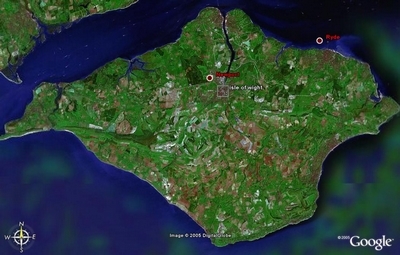 However if you happen to be an alien from outer space then you will have your own specialised transport so this next map, provided by courtesy of Google Earth, could well be of greater help. We welcome all sorts here, you see, except madcap drivers. So having arrived here, where are you going to go? Well if you'd looked at the most excellent and helpful Wight Index you would have been able to have planned in advance, wouldn't you? And if the exorbitant ferry fares combined with my motoring notes have deterred you from bringing your car, then you will need to use our pricey bus service. 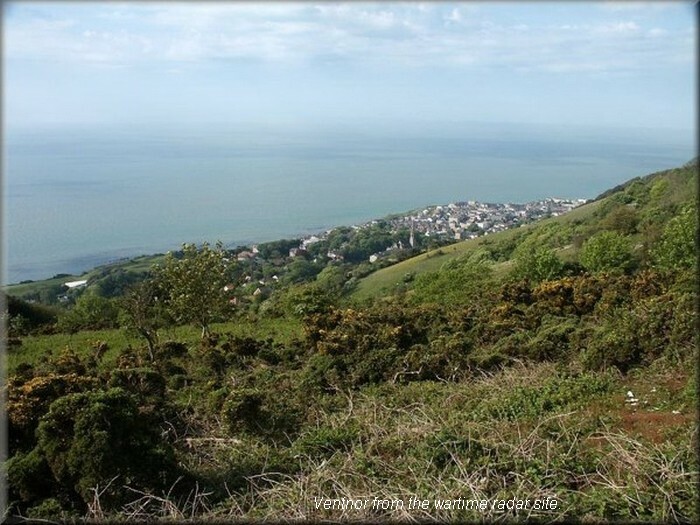 And finally, here are the views of Ventnor that those reaching here from my Ventnor Radar site might very reasonably have been expecting from the outset. 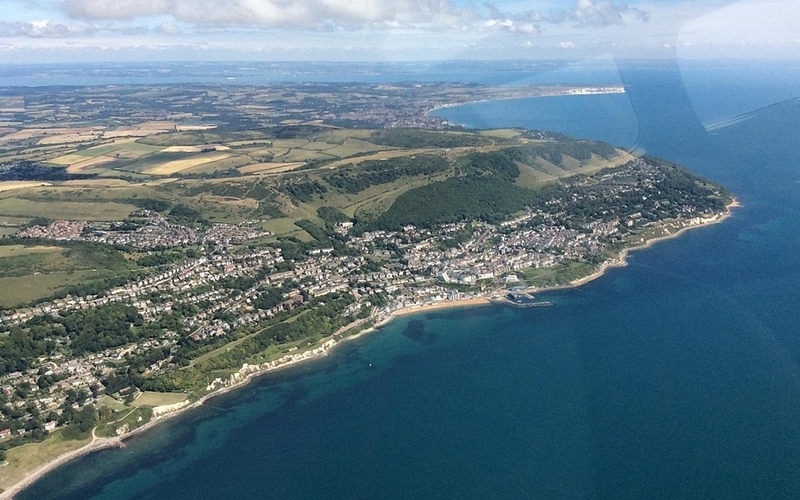 This specially comissioned photo of Ventnor shows where the radar site was situated i.e. at the top on the flat part. In the reverse view Ventnor is seen snuggling very prettily against the foot of St.Boniface Down. Americans and aliens should note that in this context a 'down' means an 'up'. Silly isn't it? However the official Town Council website is worth a look, or you could try the Isle of Wight News (formerly 'Ventnor Blog') site if you feel the need to read a vibrant bang up-to-date outlook on The Island.